In recent years, Americans have begun to emulate Europeans in the preservation of some of their oldest and most important landmarks, including their homes, houses of worship, temples of commerce, railroad stations, cemeteries, parks, sculptures and statues. Maybe we have found it more economical to revitalize our older architectural masterpieces because of their priceless craftsmanship, or maybe there has been a realization that it is simply cheaper to put new architectural wine into a fine old bottle—or perhaps it has been a combination of both interpretations. At any rate, a certain national architectural maturity seemed to have been reached when Jackie Kennedy Onassis stood up to defend Grand Central Station against the fate that met New York's Pennsylvania Station, and the fight to save the air rights over Park Avenue's magnificent St. Bartholomew Church, a fight that spared it from the fate of a giant skyscraper obscuring its view of the heavens. These were big battles carried out in the 1960s in the courts as well as on the picket lines of the world's greatest city. They served as lessons for all American cities, great and small, near and far. For as Manhattan slowed in its destruction of some of its great landmarks, Newark and other major American cities began to look at their own projected financial and heritage losses. Originally one of the 'insurance castles of the Prudential,' the 'Gib' was built in several phases during the 1920s. Indeed, if this concept had been inculcated into our very architectural existence, we probably would not have lost the 17th-century Meeker farm home on Lyons Avenue in 1909 and the parsonage of the Rev. Aaron Burr. Most likely the first home of the College of New Jersey at Broad and William streets would still be standing, and the Prudential's Broad Street skyscrapers of 1890 would be part of today's skyline. Similarly, the old Ballantine malt house at McCarter and Rector would not have burned, and the turkey-frieze building of the old Essex Market on Washington Street would still be photographed at Thanksgiving. Not all has been lost. Quite the contrary. There have been some notable successes in local architectural rehabilitation. So today, let's look at three of the best: a 19th-century mansion that has been converted into one of the tri-state area's best historic house museums, a brownstone townhouse perimeter of an old park and an adjoining office building, and a Cass Gilbert-designed office structure that opened last week as a new court complex. One of the best restored houses in the state, perhaps in the tri-state region, is the Ballantine House, now part of the Newark Museum, built in 1885-86 for John A. Ballantine, one of the sons of the founder of the Ballantine brewing empire. The house is the lone survivor of a vanished era of the 1860s and 1870s, when the park was home to the Wards, Coes, Faitoutes, Vanderpools and others. While the first generation of Ballantines lived on the site of the brewery, the sons and their families moved to the park. The fine Renaissance and Roman Mosque Revival house originally had 17 rooms and was enlarged in 1900 to 20. Its exterior was of Philadelphia pressed red brick with gray Wyoming sandstone, the edifice topped by a modified mansard roof with tall flanking chimneys. The mansion's interior contains the finest carvings in mahogany, maple, cherry and ash, and beautiful English fireplaces were found throughout the building. The Ballantine House and many other residences in Newark reflected the fine German and Italian craftsmen who made up a large number of the work force. Many of these artisans later were employed in buildings such as the Sacred Heart Cathedral, City Hall and major downtown churches. Other notable features of the house include the library with its distinctive 'sun worshiper' stained-glass window—the symbol of the Ballantine family itself—a massive dining room with its heavily antique leather wallpaper, the gold-and-ivory parlor painted in soft colors and dominated by a great fireplace, and a great bay window covered with velvet and gilt appliques. The reception room features oak and cherry parquet floors, the ceiling is a painted and gilded canvas, and the walls have an imitation leather paper with an embossed border. Period furniture of 1891 decorates the room, ensuring 'its somber character and quiet restfulness. The parlor was used for the serious business of receiving formal callers and important visitors.' Painstakingly researched and faithfully restored, the Ballantine House serves as an example of how a building can be correctly saved for future generations. According to Mary Sue Sweeney Price, director of the Newark Museum, 'Newark's own Ballantine House is the only extant mansion in the region that is authentically restored and open to the public.' Throughout the year, school buses and tourist vans bring visitors to the Ballantine House restoration and to the museum. A second successful adaptive historic rehabilitation effort in Newark is seen at the south end of Broad Street at Lincoln Park through the efforts of Integrity Inc. and Essex Plaza. Here, a whole 19th-century silk stocking district has been preserved, serving a different function than that for which it was built. According to Richard Grossklaus, through the stabilizing efforts of Integrity, the two- and three-story brownstone mansions continue to face the park, but their interiors now serve as a social agency, no longer as residences. The 18th-century homes of Thomas Lyon, Thomas Pierson, Joseph Riggs and Martin Tichnenor once occupied the area. In the 19th century, jewelry company founder and owner George Krementz, Prudential Insurance Co. founder John F. Dryden and the McCarter family all lived on or near the park. The 20th century saw the construction of the old Mosque Theatre, now Newark Symphony Hall, the Medical Tower, and the Newark Industrial Office Building, as well as the home of famed physician Henry Kessler. The 1960s witnessed the start of Integrity with its first purchase of a building by David Kerr, president, and Richard Grossklaus, vice president. Since that time, Integrity has grown into one of the state's largest substance abuse and federal prison programs. During that time, the agency purchased buildings all around the park and its boundaries. The largest building on Lincoln Park is now known as Essex Plaza. It was built in 1926 largely through the efforts of Louis V. Aronson and originally was named the Newark Industrial Office Building. At the time of its construction, the building was the state's largest office center. It is surrounded by Broad and Pennington streets and Elder Place, with a 309-foot frontage on the former streets and 209 on the latter. The eight stories were designed to accommodate 3,000 employees. During peak periods, more than 35,000 people passed by its doors daily. The building's interior was spacious, containing 111/2-foot-high ceilings, 8-foot corridors and six high-speed elevators. It was designed so that every room had an outside view. Additionally, it had 350,000 square feet of rentable office space and 45,000 feet for storage. Advertisements of the day billed the office building as a 'Business Mansion for Newark Business Leaders.' Its developers claimed, 'it offers all the advantages of a New York headquarters, without the disadvantages of New York's congestion.' While the building seemed like a dream to its builders, it met with immediate difficulties in its attempt to pull commerce away from Broad and Market streets, partly because of the pressures of the Great Depression. In its early days, some of the building's prestigious clients included the Tidewater Oil Sales Corp., Montgomery Ward, Western Electric, Universal Carloading Co., the U.S. Treasury Department and New Jersey governmental agencies such as the Department of Banking, the Highway Department, the Public Utilities Commission and the Court of Chancery. In the 1960s, after many financial problems, the building was transformed into a senior citizen housing unit called Essex Plaza. Its original $6 million adaptive rehabilitation resulted in better housing for hundreds of seniors and brought a national award to its administrators as one of the best-run senior citizen housing agencies in the country. A third successful adaptive renovation in downtown Newark is Prudential's former Gibraltar building. Originally one of the 'insurance castles of the Prudential,' the 'Gib' was built in several phases during the 1920s. 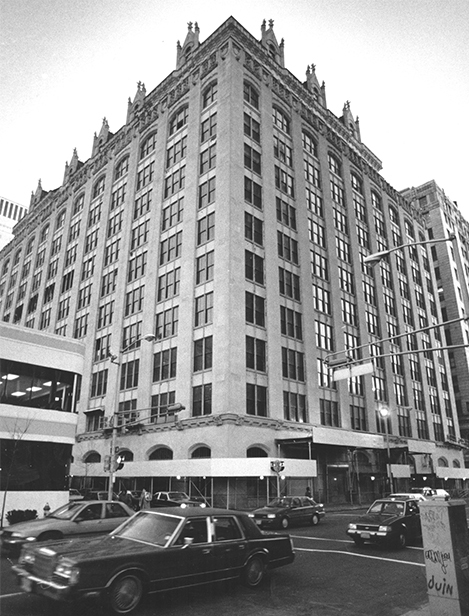 The first stage of renovations came in the 1980s when Hartz Mountain purchased the building and remodeled the first seven floors for state agencies. This year, on October 23, the upper seven floors were formally dedicated and named the Robert N. Wilentz Court Complex, after the late chief justice of the New Jersey Supreme Court. The term Gibraltar goes back to Mortimer Remington, who lived in the Forest Hill section of the city. He developed the name and logo in 1896 and persuaded John Dryden to use it to represent his new company. The term Gibraltar was again used 25 years later as the name for the 14- story, nine-bay structure designed by the famous architect Cass Gilbert. The building's facade is divided into three horizontal elements. At ground level, each elevation contains four arched windows on each side of a central entranceway. This is topped by a gargoyle cornice. The upper three stories are set back and crowned by a hip roof ornamented by gabled dormers. The new court complex was designed by Grad Associates. York Hunter Inc. was the construction manager in association with Gibson Associates and Ramirez Associates. All of these firms are based in Newark. The 220,000-square-foot project was coordinated by the Essex County Improvement Authority at a cost of $24 million. The design and construction team's efforts to renovate the upper seven floors were challenged by the building's regular pattern of columns. Creative approaches resulted in 18 unique courtrooms, many with vaulted ceilings, worthy of our judicial system. This new court complex is dedicated to families. In addition to the courts and court-related offices, the new spaces house the state Division of Youth and Family Services as well as agencies devoted to child support enforcement, domestic violence, taxation and the chancery courts. Families in crisis can come for intervention, protection, assistance and justice. Taken together, the three conversions we have detailed are an excellent record for any American city: a great house, now a museum; a saved park and reconverted senior citizen complex, and a former office building, now a new court complex. All three owe a great deal to the past. Through their new uses, Newark's architectural past survives and moves us further into the future.